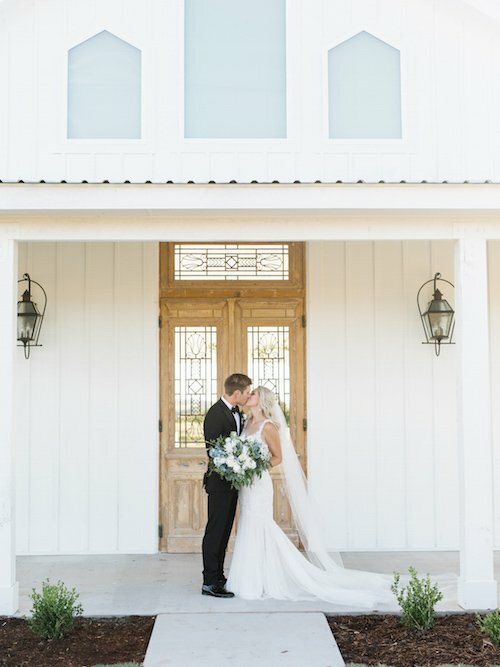 We still dream of this romantic wedding that is so light and airy, it’s as if it was held on a cloud! 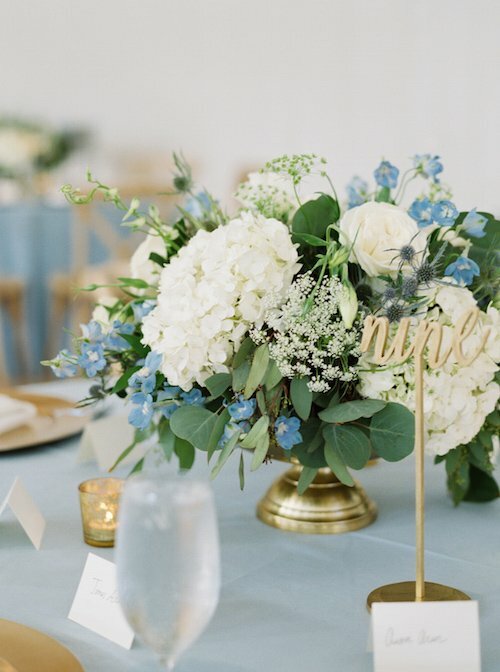 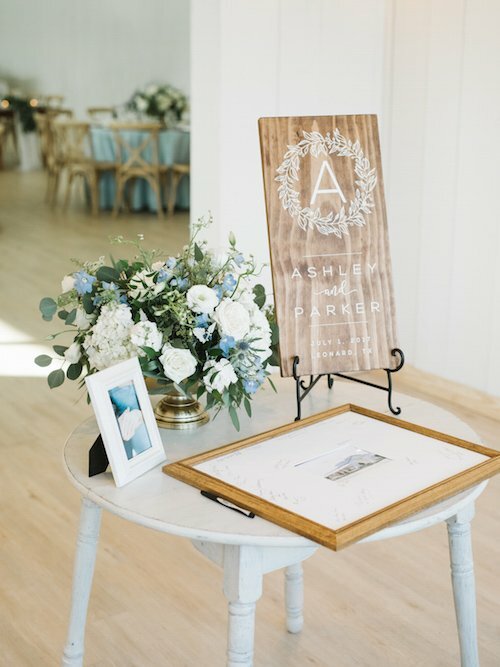 The all white venue, dusty blue accents and fresh greenery all came together perfectly for Ashley & Parker’s vision. 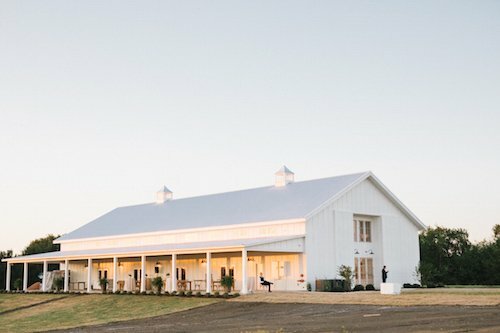 Of course, they had a hand in that as they built their own venue! 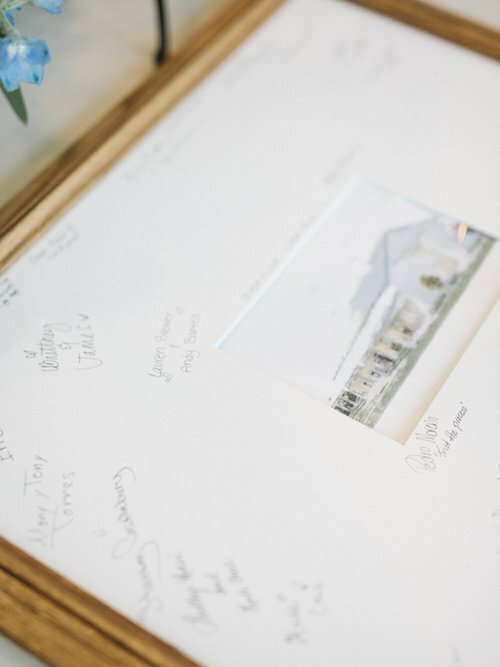 The Grand Ivory has become a very popular wedding venue near McKinney and the DFW Metroplex. 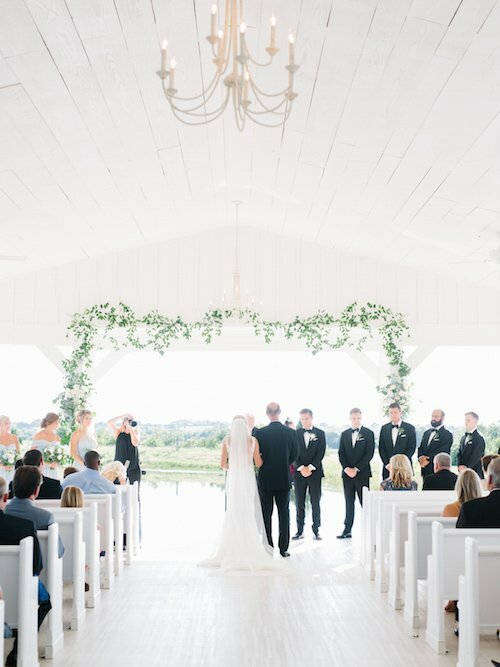 The open air, outdoor chapel overlooking the pond combines with a beautiful barn to makes anyone who sees it swoon. 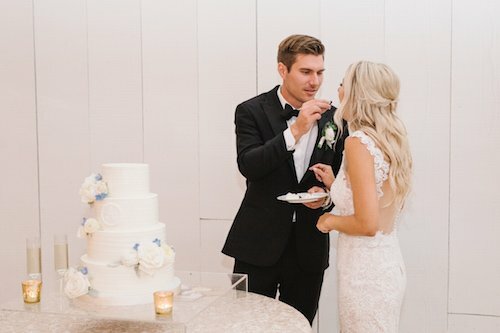 Their wedding played up all the design-strengths of their venue and their photographer, Tenth & Grace, captured the sweet details of their special day. 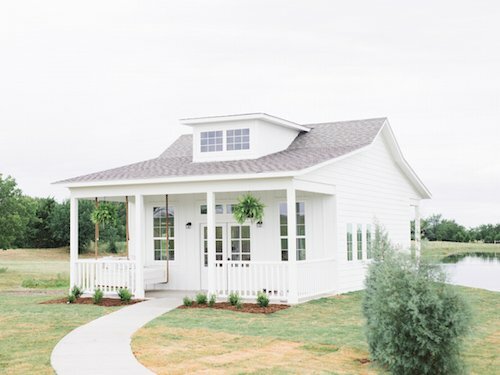 Of course, we have to start with the super cute cottages for the couple to get ready in! 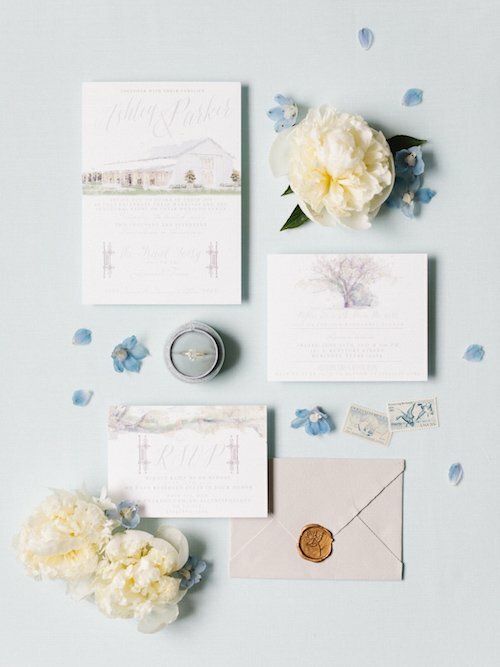 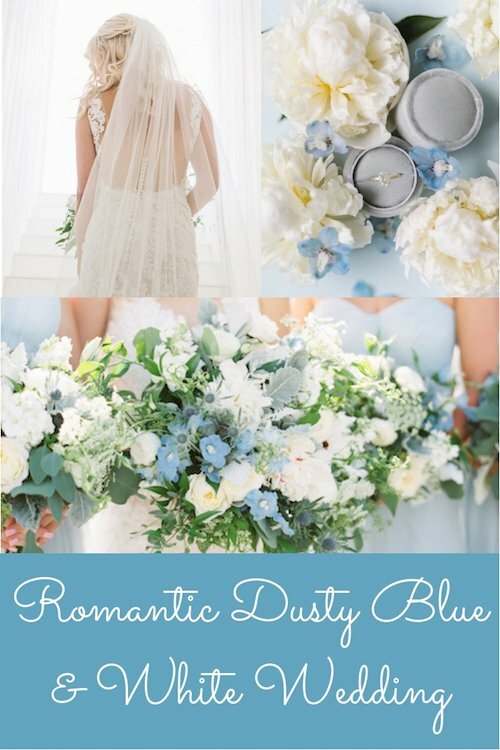 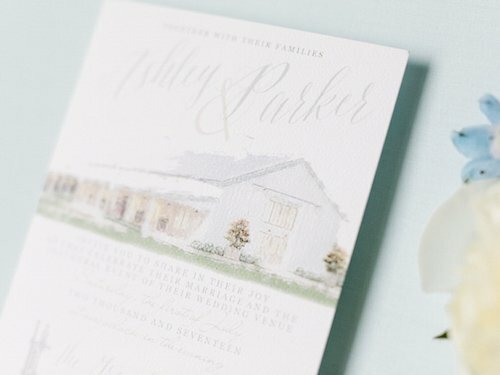 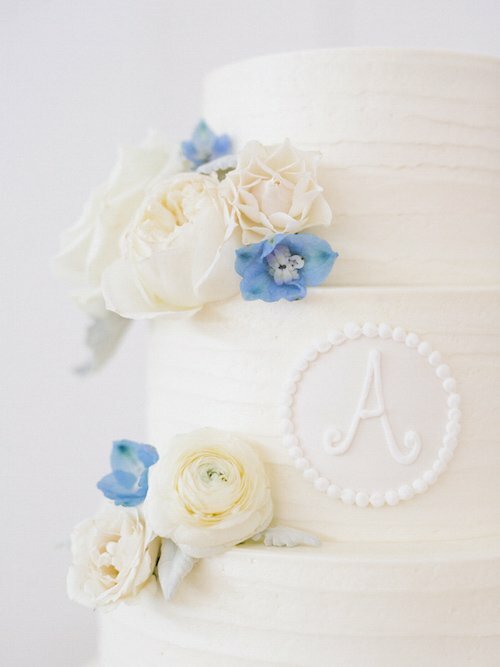 The all white cottage is perfection for brides and the sweet light blue cottage is perfect for her groom. 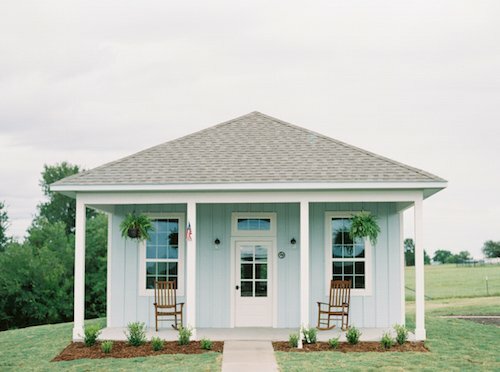 And who can resist an outdoor swing on a covered porch? 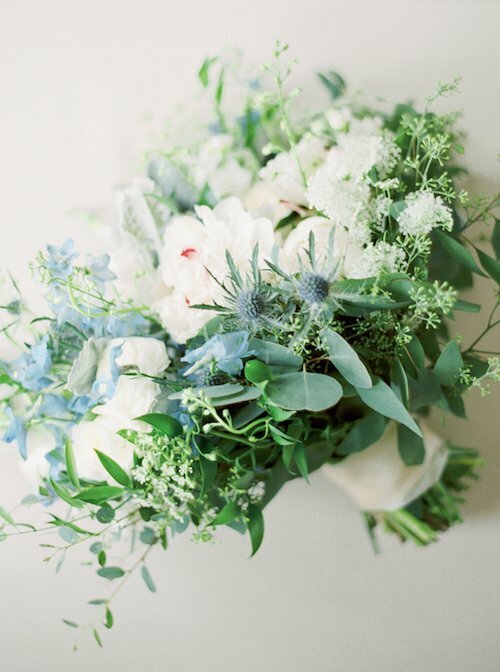 Her bouquet was perfection with the gorgeous peonies and touches of blue from thistles and delphinium. 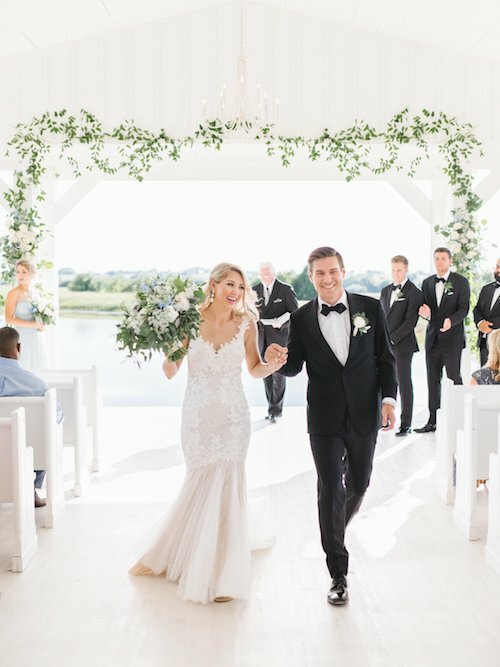 Those chapel doors were such a great entrance and we loved how the ceremony was decorated simply with greenery. 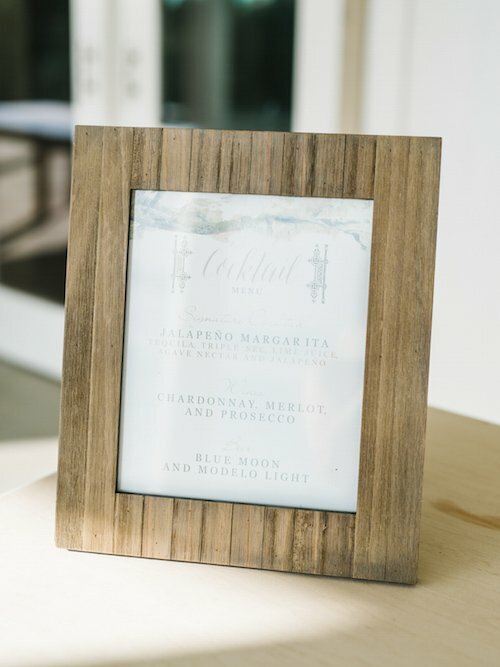 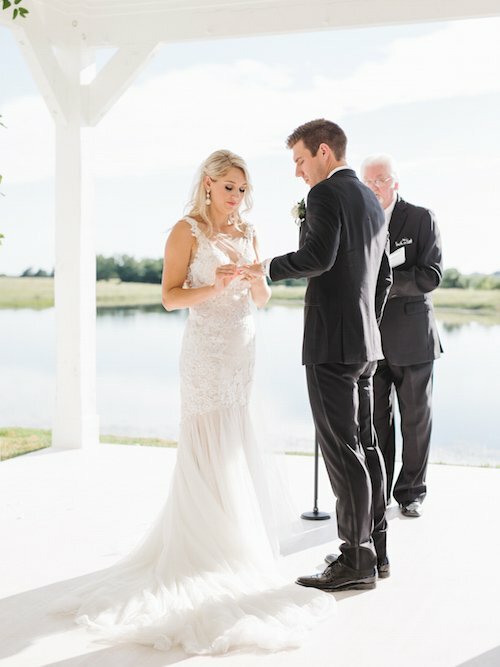 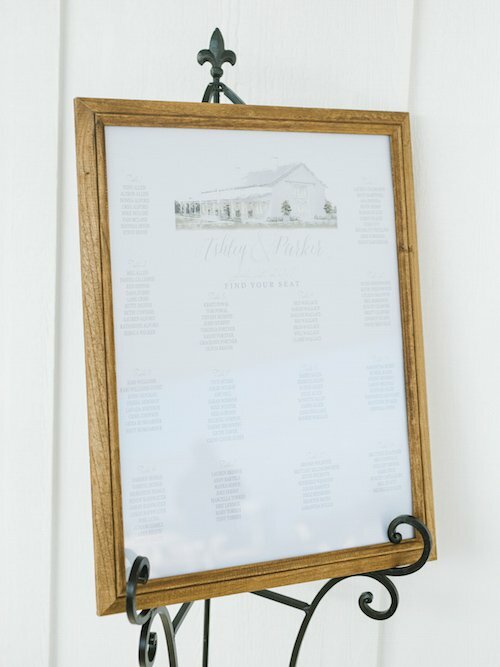 After the ceremony, guests were guided into the reception and throughout with a custom seating chart featuring the venue drawing, along simple and cute signs from the welcome table to the bar. 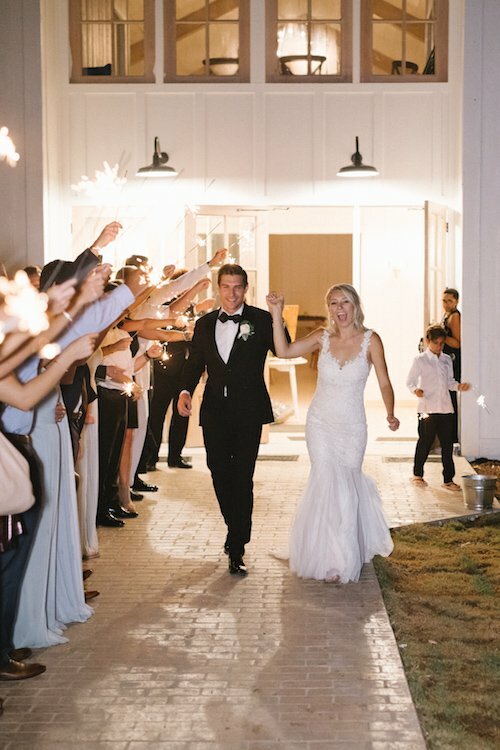 During cocktail hour, the wedding party snuck away to the beautiful brick archways on the property (which can be used for an outdoor ceremony) to capture some fun shots and elegant portraits. 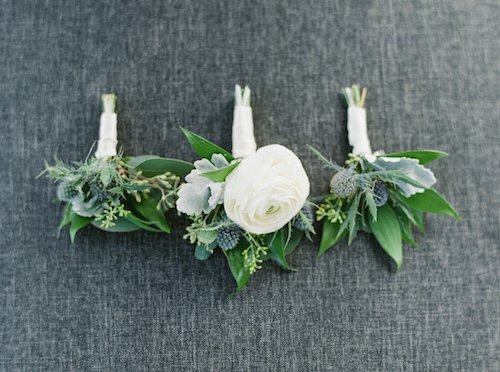 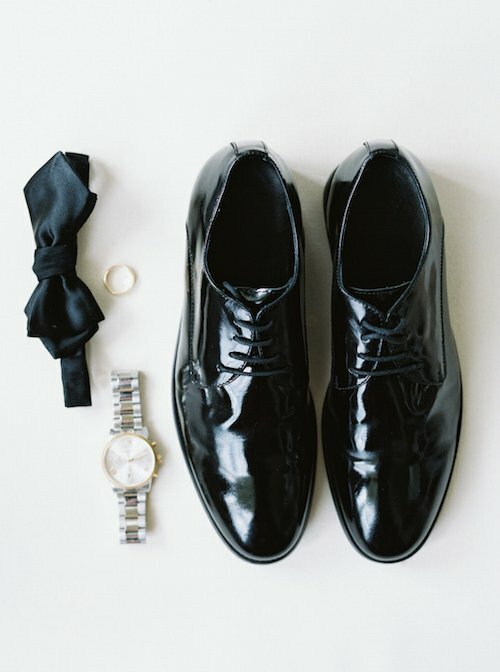 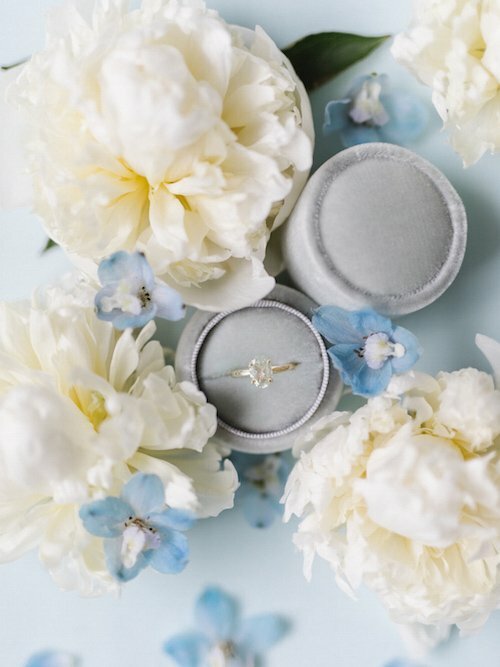 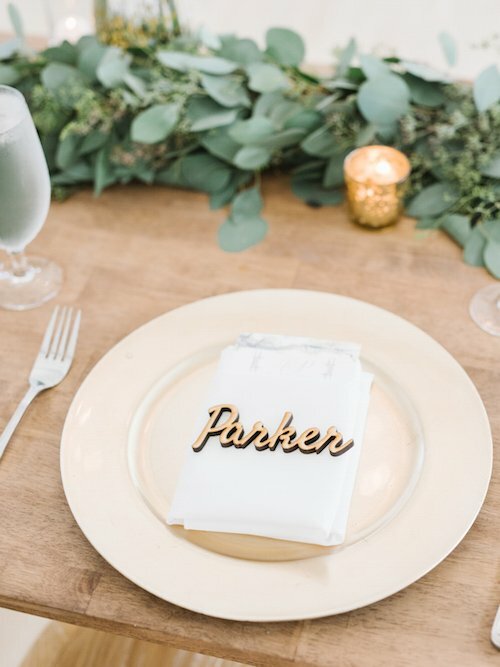 We loved how the photographer also took time to capture all the little details, from jewelry to centerpieces of this wedding. 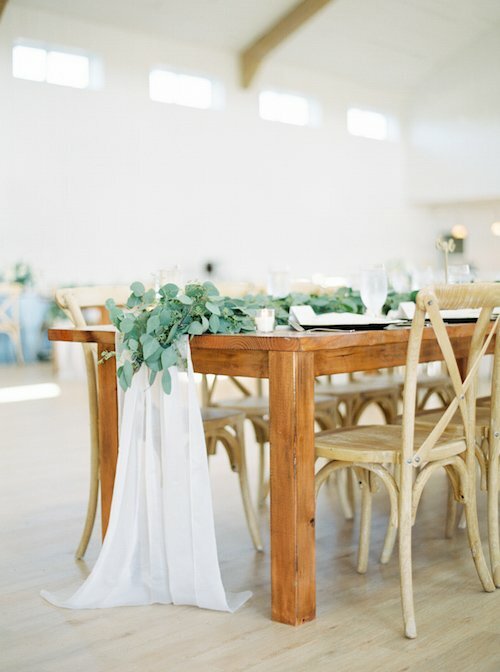 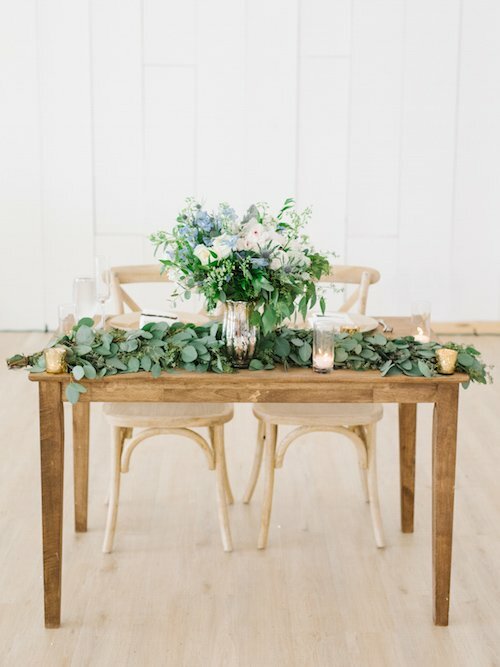 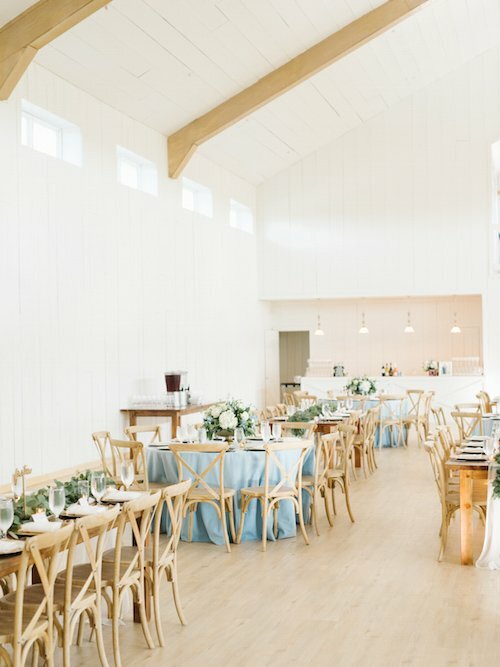 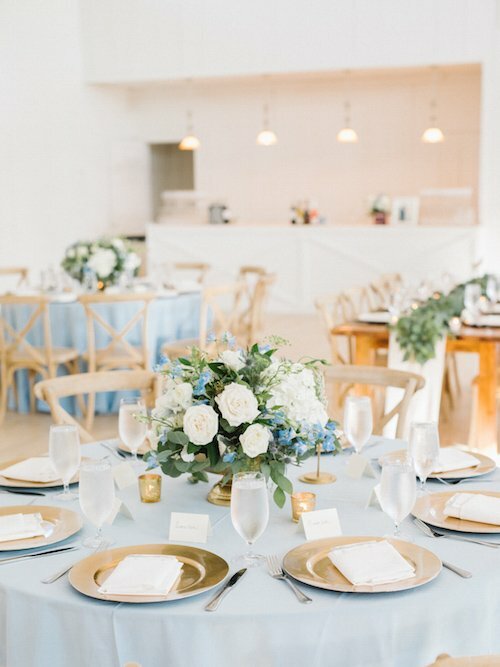 Farm tables, white wood cross back chairs and dusty blue linens with simple floral and candle centerpieces created a soft and romantic feel for their reception. 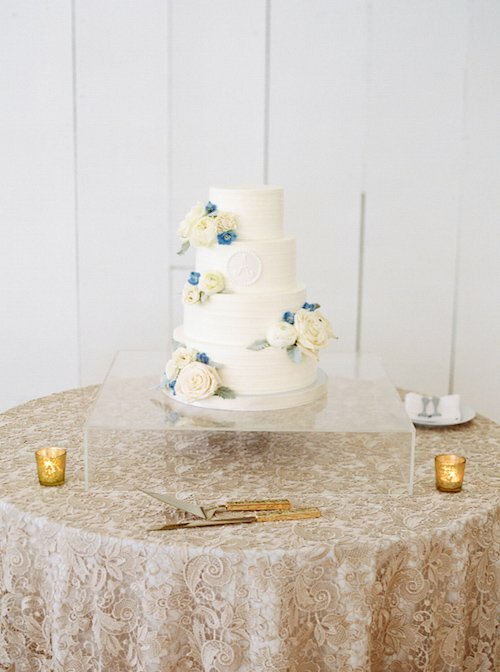 Our acrylic cake stand had the bridal cake appearing to float on air! 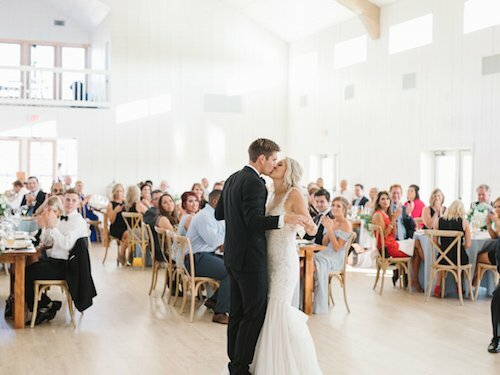 A fun time was had by all as they saw the sun set during dinner and danced the night away. 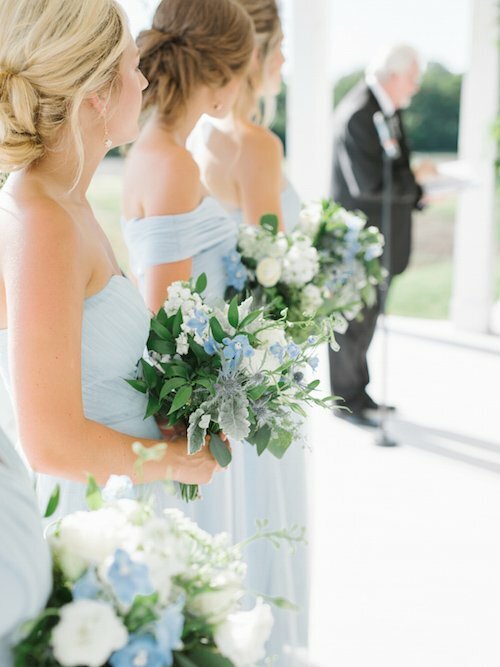 With the perfect vintage blue ford limo to complement their theme, Ashley & Parker left that evening as the first couple to get married at their venue, setting the standard with this gorgeous affair! 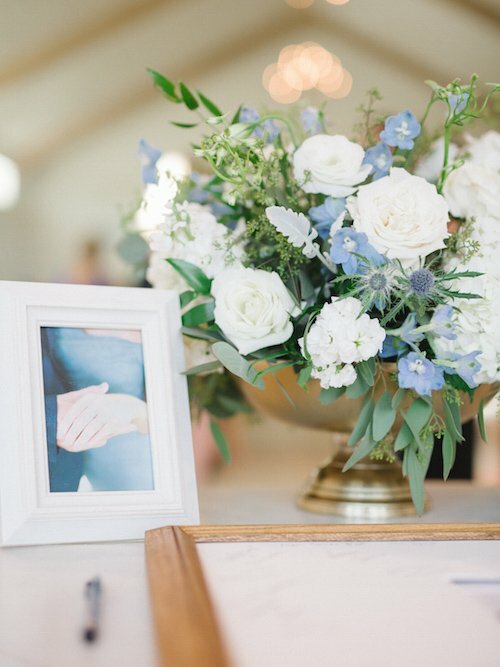 Wendy is the Owner of Each & Every Detail and has over fourteen years of experience in the wedding planning industry. 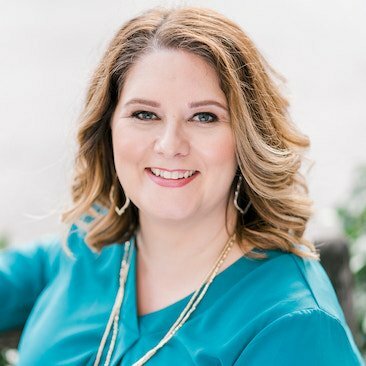 She is currently the President of the American Association of Certified Wedding Planners and holds the status of Certified Master Wedding Planner.